Taste test: I had to rely on a couple of other testers to get this review as I am a vegetarian. Most people raved about these chips, calling them the finest of the Kettle Chip line. A few did bemoan their excessive saltiness. 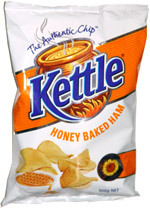 Generally, though I am assured that the honey baked ham was a brilliant choice for a new flavor of Kettle Chips. Smell test: A distinctive baked ham aroma.